We have three winners today! The winner of Margo Maguire’s book is Mary Preston. The winner of Debbie Mazzuca’s book, Lord of the Isles is Michelle Harlar, and the winner of Laurel McKee’s book, Countess of Scandal, is Sharon Delacueva. Congratulations, ladies! I’ll be in touch. Thanks to everyone for stopping by the blog. I’ll be taking a few days off the celebrate the Christmas holiday with my family, and to do some fine-tuning of my blog–hopefully eliminating those naughty spammers who keep clogging things up! I’ll be back next week with a guest post from historical romance author, Theresa Rhomain. Have a merry and happy Christmas, everyone! My mom used to spend the weeks before Christmas baking cookies by the dozen. She’d then store them in tins in our basement freezer, taking them out for holiday meals or when friends stopped by for a cup of coffee. I have so many wonderful memories of our house smelling like a baker’s dream, and I loved spending time in the kitchen helping my mom and liberally sampling the results of our work. Here are two of my mom’s best cookie recipes. Cream the butter, sugar, and vanilla together. Stir in the water and then add the flour. Mix till blended then stir in the pecans. Roll into one inch balls. Bake on an ungreased cookie sheet for 15-20 minutes, at 300 degrees F. Cool before removing from sheet, then roll the balls in the frosting. Refrigerate or freeze until just ready to serve. Frosting: 4 cups of confectioner’s sugar mixed with ½ cup of milk. Adjust with sugar or milk to get the consistency that is best for icing. Combine first seven ingredients and mix. Add the sifted flour and baking soda to mix. Add remaining ingredients and blend well. Drop by teaspoons on greased baking sheet. 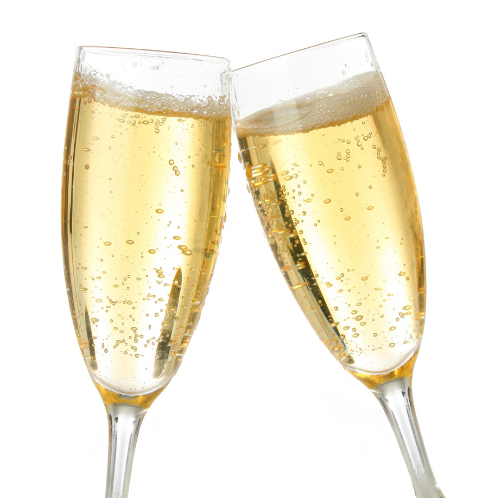 Press slightly with a fork coated in sugar, or the bottom of a small glass coated in sugar (just press the glass in a dish of sugar – enough will stick to do the trick). Bake at 350 degrees F for 12-13 minutes, checking to make sure the cookies don’t scorch on the bottom. And what goes better with tea and cookies then a nice book to read? As it’s the holiday season, I’d like to give away some books to celebrate Christmas. The first of two is Countess of Scandal, a lovely historical romance by Laurel McKee. The second book is Lord of the Isles, a fab Scottish paranormal romance by Debbie Mazzuca. 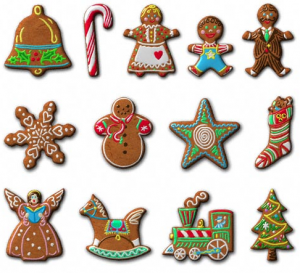 Just tell me what your favorite cookie recipe is to be eligible. Two people will each win a book! Note!!! I’ve had to disable the comments temporarily because my blog is getting flooded with spam. My webmistress is working to correct the problem, and we should have comments back up shortly. Check back tonight or tomorrow, and thanks for your patience! And I WILL be awarding those two books by tomorrow evening! And the winner of my Regency Friday Fun giveaway is Johanna Jochum! Congratulations, Johanna. You’ll be receiving a copy Debbie Mazzuca’s debut book, Lord Of The Isles. Johanna, I’ll be in touch with you soon! Earlier this week we made a visit to Fort Clinch, a well preserved military installation in a beautiful state park on Amelia Island, just on the border of Florida and Georgia. Throughout it’s long history, Amelia Island has been under the governance of eight flags, and was first settled by the French in 1562. For the next few hundred years, the island passed back and forth between the French, the British, and the Spanish, finally falling into American hands in 1821. My laughably brief history doesn’t even cover the period during the Regency when Amelia Island was under the control of pirates and smugglers – I’ll cover that in another Regency Friday Fun post in the next few weeks. As you can tell, Amelia Island had a tumultuous history and was considered by all its occupiers to have great strategic importance. In 1842, the U.S. government purchased a tract of land on the northern tip of the island, on which to build a military installation to guard the mouth of the St. Mary’s River and to defend the deepwater port of Amelia’s thriving town, Fernandina. Construction began on the fort in 1847, but was as yet uncompleted by the start of the Civil War. With no federal garrison on site, the Confederate Army claimed it until 1862, when federal gunboats and troops moved in to reestablish Union control. Units of Army engineers than began a push to complete the fort. Today, Fort Clinch is preserved as it was during the Civil War and its occupation by the 1st New York Volunteer Engineers. The guides are trained reenactors, much like those in Williamsburg, Virginia. They do a great job showcasing life at the fort during the Civil War. The fort itself is a large set of fortifications on the beach, with some of the rooms built right into the massive walls. As you can see from the picture at the top of the page, it was a cold and gloomy day when we visited. 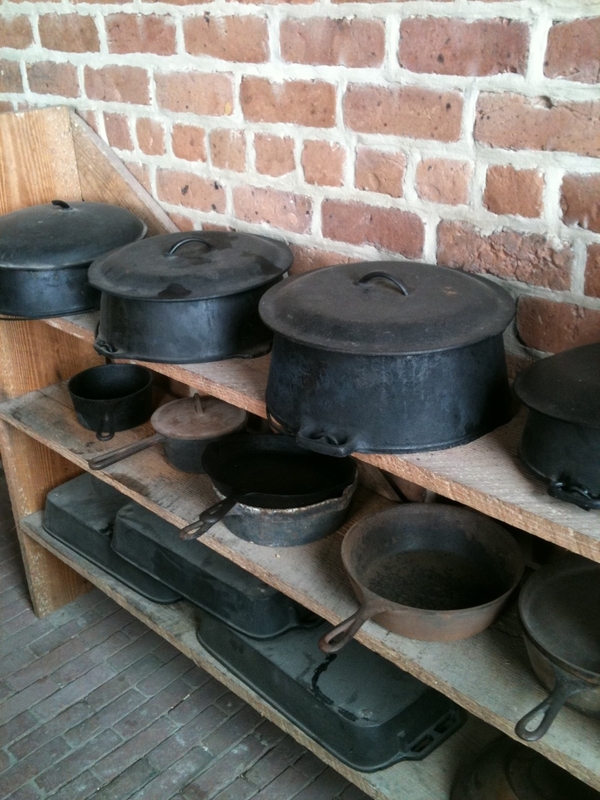 We scuttled over the Officer’s Kitchen, which had a fire going and was the warmest room at the fort. 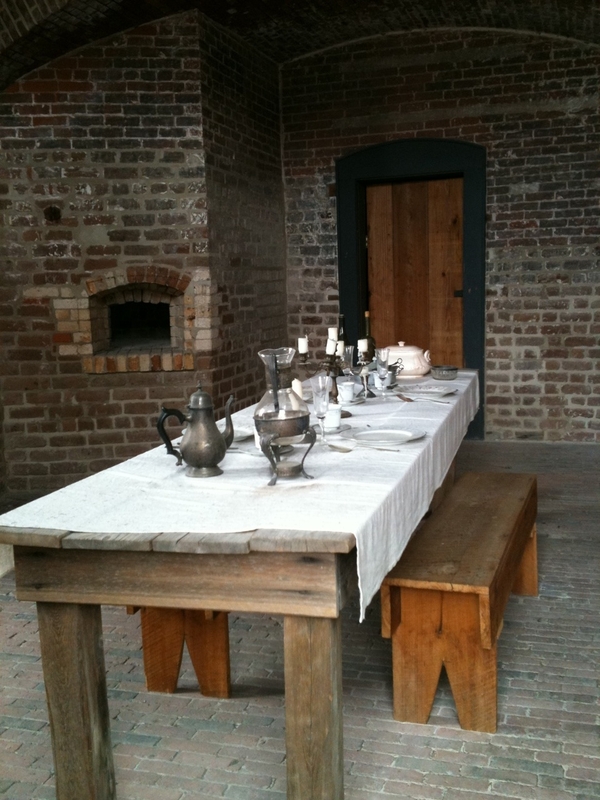 The kitchen also served as the dining room, and held a degree of elegance since the table was set with linen and proper china and cutlery. Also in the kitchen was an impressive display of pots and pans. The Guard Rooms, where the off-duty guard contingent stayed, also felt pretty cozy on a blustery day, and the men stationed there clearly tried to make the room something more than a utilitarian bunkhouse. 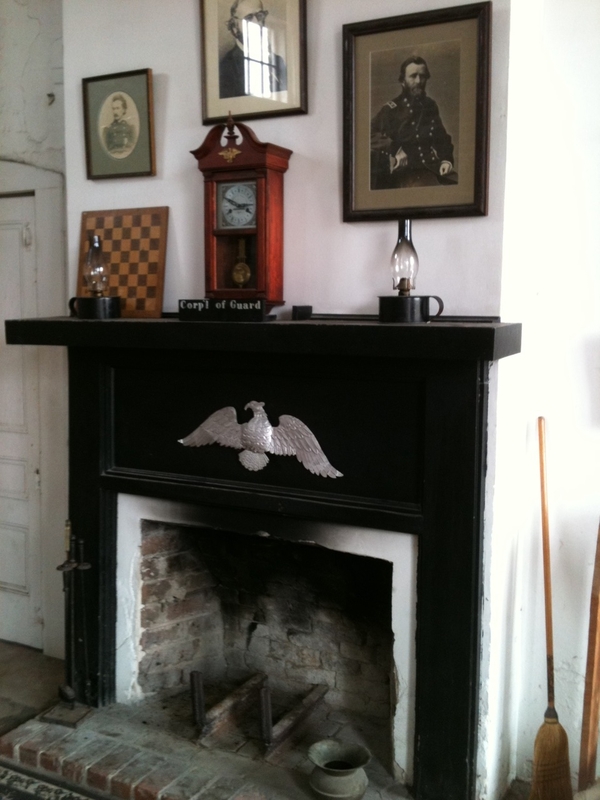 The clock is beautiful, and the presence of the chess board on the mantelpiece indicates how the men passed their time. 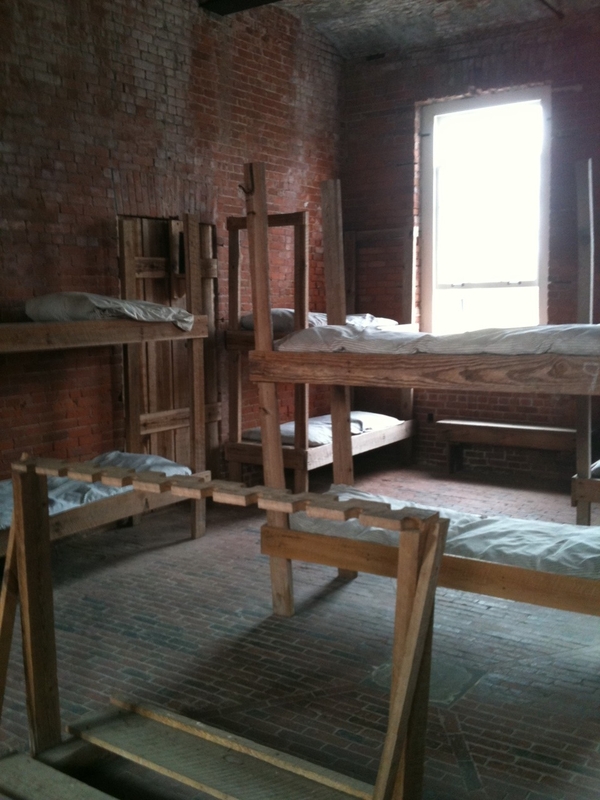 But make no mistake – this was a working fort, with a pretty spare way of living, especially for the enlisted men. 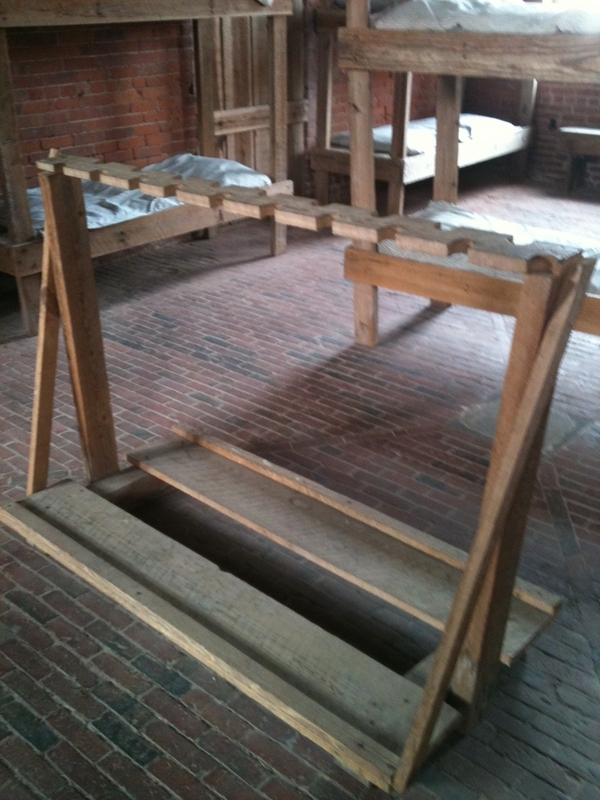 Here are their barracks, complete with rifle rack to store their weapons. Here’s a closeup of the rifle rack, which gives you an idea of how many men probably shared the same living space. 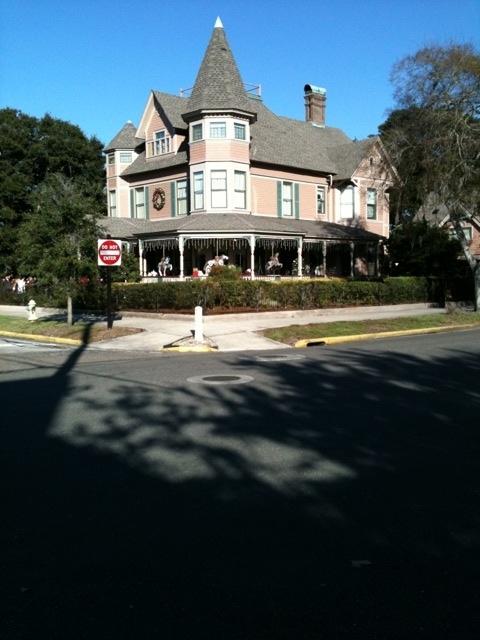 You’ll no doubt be shocked to hear that the officers didn’t reside at the fort but in town, living in the beautiful Victorian houses that lined the streets of Fernandina. But the men at the fort obviously preferred it that way. After all, they were doing all the work, while the officers just mucked things up and made life difficult. According to our guide, the soldiers and engineers breathed a collective sigh of relief on the days when the officers stayed in town. It’s amazing how some things never change. I have lots more pictures of Fort Clinch, but I’ll save those for another post. And since it’s Friday, I’m doing a book giveaway. It’s a copy of Lord Of The Isles, a paranormal Highland historical by my very talented friend, Debbie Mazzuca. All you have to do to win is tell me what’s your favorite historical site or park to visit. 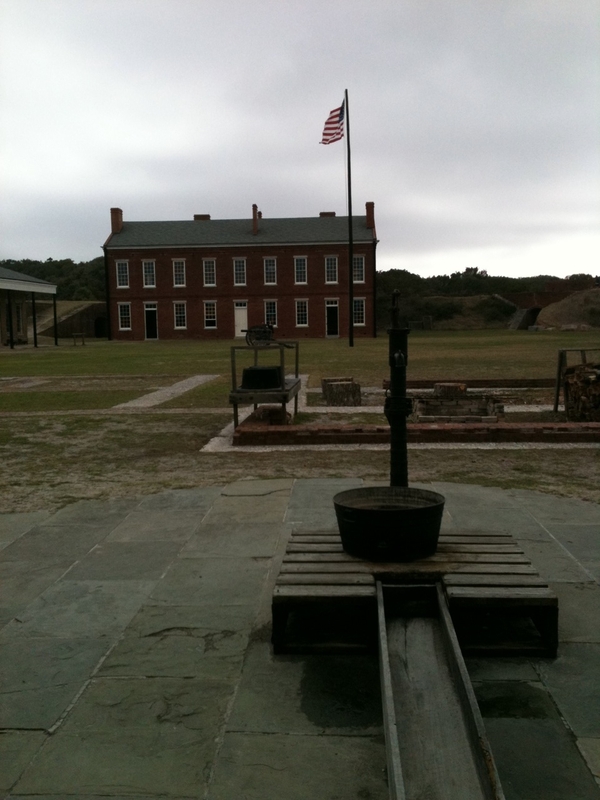 Fort Clinch is certainly one of my favorites, and well worth the visit.